This new tech heavyweight is lighter than air. Apple unveiled a thinner, lighter version of its popular tablet called the iPad Air along with a slew of new Macs and new software at a Tuesday event in San Francisco -- just in time for the holiday shopping season. 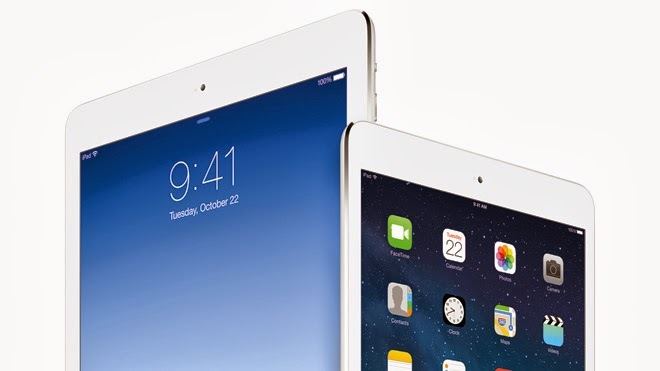 The Cupertino, Calif. company said the iPad Air weighs 1 pound, compared with 1.4 pounds for the previous version. Apple marketing chief Phil Schiller called the tablet a "screaming fast iPad" that's eight times faster than the original, which came out in 2010. The iPad Air will go on sale Nov. 1 and start at $499, while the iPad 2 will continue selling at a starting price of $399. BUt Apple CEO Tim Cook first took the stage to announce major updates to the company's line of computers. "We have an amazing line up of desktops and notebooks," Cook said. "And we've had one focus since the beginning: to build the best personal computers in the world." Unlike the competition, which Cook called "confused," Apple has a very clear direction and a very ambitious goal, he said. "We still believe deeply in this category and we're not slowing down on our innovation. We've been really hard at work on the Mac." The comment was likely a reference to Microsoft, which began selling a new version of the Surface tablet computer on Tuesday as well. That product is essentially a 10.6-inch tablet, but an innovative, snap-on cover with integrated keyboard lets it convert into a slick laptop. On that front, Apple had news of its own: A new, 13-inch MacBook Pro with Retina display that's thinner and lighter than earlier models, Apple marketing chief Phil Schiller said. The laptop has up to 9 hours of battery life, he added, enough to "watch the entire trilogy of 'The Black Knight' on one charge." The notebook's new price is lower, too: $1,299, compared with $1,499 for the previous version. A larger MacBook Pro, with a 15-inch monitor and 256 gigabytes of storage starts at $1,999, compared with $2,199 for the previous version. And the Mac Pro, a high-end desktop computer aimed at power users, will be available in December for $2,999. Apple said nearly two-thirds of its mobile devices are running iOS7, the revised operating system it released in September. Twenty million people have listened to iTunes Radio about a month after its release, he said. 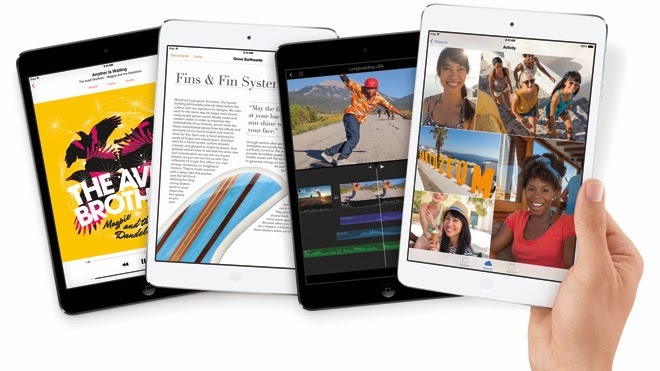 The company sold 14.6 million iPads in the June quarter, down 14 percent from the same time last year. The iPad's market share has been eroding compared with cheaper products from rivals running Google's Android operating system. Ovum analyst Jan Dawson, chief telecoms analyst, said the company clearly had no plans to undercut those rivals. “This is the clearest statement Apple could have made that it is only interested in competing in the premium tablet space. The yawning gap between the specs of the cheaper iPad Mini and iPad 2 and the new iPads signifies that it is only willing to compete at the lower price points with older models." The iPad's marketshare will continue to shrink as a result, Dawson said. "This reinforces our view that Apple's share in tablets will continue to fall as Android's share rises over the coming years." Research firm Gartner estimates that Android tablets will end 2013 with a 50 percent share of the worldwide market versus 49 percent for the iPad. Just two years ago, the iPad commanded a 65 percent market share compared to 30 percent for Android tablets.